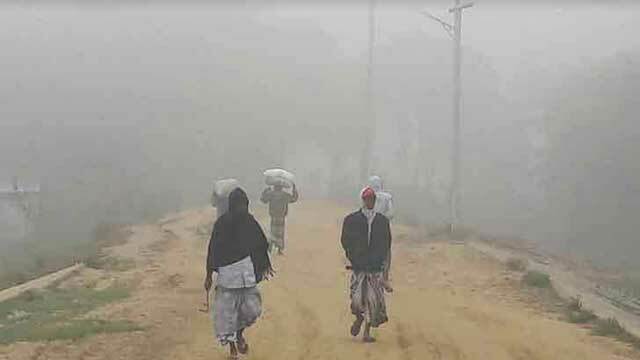 Dhaka, Jan 8 (Just News): At least twelve people, including six children, died of cold related diseases in Rajshahi, Kurigram and Thakurgaon districts in last four days as the northern districts bore the brunt of a cold wave crossing over of the country. In Rajshahi, four children died of cold-related afflictions at Rajshahi Medical College Hospital (RMCH) on Saturday, said assistant professor Dr Sanaul Haque, head of RMCH pediatric department. All of them died from pneumonia, he added. The deceased were identified as four-day-old baby girl, daughter of Abu Hanif of Putia upazila, two and a half-month-old boy Pias, son of Shimul Islam of Chatmohor in Pabna, three-day-old baby girl of Shahjahan of Natore and two-day-old baby of Shushil Pramanik of Naogaon. A total of 271 children have been admitted to the hospital between January 3 and Sunday noon. In Kurigram, latest death caused by the cold in Kurigram Sadar Hospital brought the total number of deaths reported there to six since last Thursday (January 4). Resident Medical Officer (acting) of Kurigram Sadar Hospital Dr Jahangir Alam said the newborn baby died of respiratory problem caused by cold weather on Sunday midnight. The first two victims were a toddler and a newborn while the latest victims included three adults - Biswa Deb Roy, 30, Anwar Hossain, 55, and Dulali, 21 daughter of Abdus Sattar, suggesting an uptick in the weather's severity. The sixth victim was a newborn baby who died of respiratory problem caused by cold weather on Sunday midnight. According to him, at least 156 patients mostly children have been admitted to Kurigram Sadar Hospital with pneumonia, diarrhoea and cold related diseases in last 24 hours. In Thakurgaon, cold related diseases claimed lives of Jahura, 70, wife of Mobarak Ali of Thakurgaon village in Sadar upazila and Sakina, 90, wife of Dabirul Islam, of Goalpara in Thakurgaon on Saturday. Thakurgaon Civil Surgeon Dr Abu Mohammad Khairul Kabir confirmed the deaths to UNB. Met offices at Rajshahi and Kurigram have recorded lowest temperatures 5.3 and 3.2 degree Celsius in the districts respectively on Monday morning.